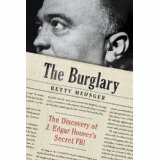 Thanks to a new book by former Washington Post journalist Betty Medsger called The Burglary, Americans can now see another example of principled, patriotic, non-violent dissenters who made America a better place by risking jail to bring important truths to light. The New York Times has a good story today about it, including a terrific video. More is at NPR. –It was a time in American history when we were fighting an undeclared war halfway around the world. –We were fighting against people whose history, culture, and language we did not understand. –We could not tell friend from foe. –With each passing year, the insurgency grew stronger and we never managed to “pacify” any territory. –American citizens tried to stop the war and were castigated as disloyal, unpatriotic. –The government engaged in a secret, illegal campaign to find and crush people it considered terrorists. The year was 1971, at the height of the American war in Vietnam, not 2003 or 2004, at the height of the U.S. “war on terror.” (Instead of al Qaeda, the FBI was targeting domestic “terrorists” like the Weathermen and the Black Panthers) After years of peaceful protests, a small group of anti-war activists decided to try a new tactic: break into an FBI office, remove the files, and divulge the secret contents to the news media. Here is a template for national security leakers. The break-in described in the new book took place in the Philadelphia suburb of Media, Pa., on March 8, 1971. That very same week, Daniel Ellsberg made his first contact with New York Times reporter Neil Sheehan to discuss divulging the massive secret files that became known as the Pentagon Papers. In both cases, people who found that they could not change policy through normal politics and who could not legally blow the whistle on wrongdoing decided to go outside the law — risking prosecution and jail — in the hope that disclosing secrets would lead to a desirable change. The comparisons to Edward Snowden are obvious. As a contract employee for the NSA, Snowden learned that the government has built a vast spying operation since 9/11/01 that includes secret surveillance of millions of law-abiding Americans in peacetime and that officials hid and lied about. The anti-war burglars in the Media FBI break-in hurt no one and did almost no property damage (they had to jimmy a lock to get in). As a result of their disclosures, no one died and the sky did not fall. Instead, the disclosures added fuel to the anti-war movement and provided vital clues to the wider disclosures that led to the Church Committee investigation and reforms. In the Media break-in, the only apparent crime was simple burglary, and the statute of limitations expired long ago. So, there is no question of penalties as these American heroes emerge from the shadows.